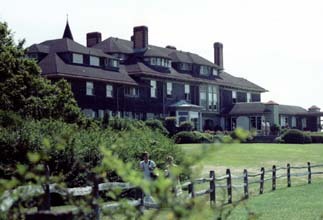 HAMMERSMITH FARM, located on Harrison Avenue (historic Ocean Drive) in Newport, Rhode Island and also known as the "Summer White House" during John F. Kennedys presidency, is a 28-room mansion and 50-acre estate built in 1887 by John W. Auchincloss. 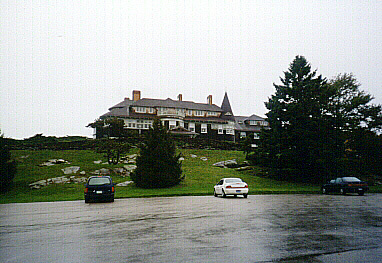 It was the "summer cottage" and residence of the Auchincloss family for four generations and was the site of the wedding reception for Jacqueline Bouvier and JFK in 1953. The house contains the original furnishings, and is also available for functions and group rates. 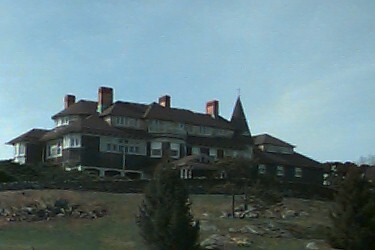 Vistas of Narragansett Bay, formal gardens, gift shop and miniature horses complete the setting of this historic estate. Guided tours are held from April 1st through mid-November daily, and weekends from Thanksgiving through December 24th, with Memorial Day through Labor Day having extended summer hours. From here you may continue on a tour of all the mansions we have visited within Rhode Island in the order that we have seen them, go to an overview of all those RI mansions, go back to our Rhode Island page, or return to the beginning of S&L's Adventures Emporium.